The two most common kinds of skin cancer are basal cell carcinoma (BCC) and squamous cell carcinoma (SCC). BCC is a slow growing cancer that seldom spreads to other parts of the body. SCC also rarely spreads to other body parts, but it does so more often than BCC. However, it is important that skin cancers be found and treated early because they can invade and destroy nearby tissue. Radiation is a very important tool in the fight against cancer. When radiation interacts with a cancerous cell, it alters the cell’s DNA (or genetic make up) and its ability to reproduce, which ultimately leads to cell death in the cancerous tumor. 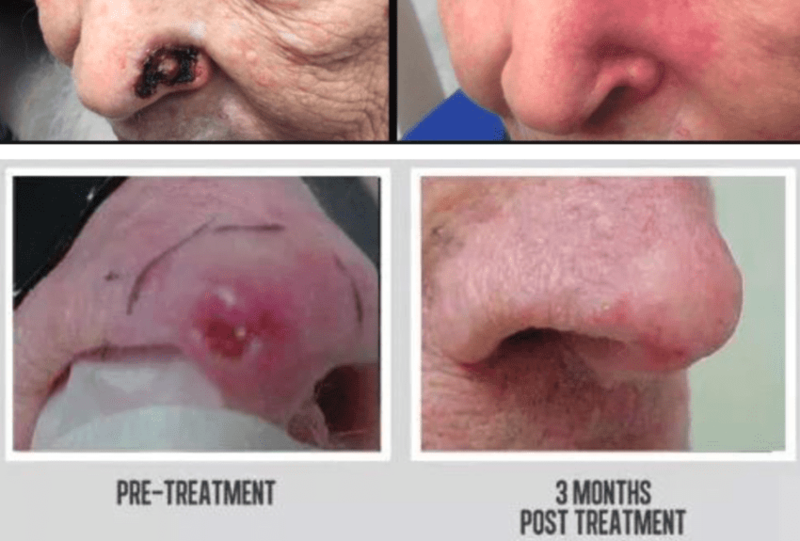 Superficial Radiotherapy (SRT), a low energy radiotherapy that penetrates only a short distance below the surface of the skin, is a highly effective, painless, and cosmetically attractive alternative to surgery in selected cancers and patient populations. The SRT 100 is the new and most advanced choice for superficial radiotherapy available today, is painless, and very similar to having an X-ray. The SRT-100 treats non-melanoma skin cancers that are found on the surface of the skin. It can be used for lesions on the arms, legs, back and trunk, but it is especially well suited for skin cancers of the head and neck regions - the folds in the nose, eyelids, lips, corner of the mouth, and the lining of the ear - that would otherwise lead to a less than desirable cosmetic outcome. ● You will be required to attend several sessions, depending on your doctor’s recommendations. ● Tell your doctor about medications you are taking and continue them unless your physician tells you otherwise. ● The X-ray will be directed toward the lesion by placing an applicator cone over the treated area. ● Once the treatment begins, it will take less than 60 seconds to deliver the therapy. ● The treatment is painless, but you will notice skin redness after the first few treatments. ● Post treatment, the skin will form a protective scab. The new, healthy skin will develop underneath it.